Advantage - Providence - Jeremy Smith comes into this series as the most experienced Goalie on either team. He has played in 16 career playoff games, and has performed well. Penguins Rookie Tristan Jarry hasn't seen game action in over a week as he has been an extra body in Pittsburgh, while the Big Pens try and get healthy in net. On top of that, Jarry didn't become the starter until the Trade Deadline when Murray was permanently recalled. Smith has allowed just 1 goal in two games against WBS this season. Advantage - Providence - I'm giving the Bruins the edge here, but I don't believe the gap between the two forward units is a wide as most people do. Rookie sensation Frank Vatrano Scored at a Goal-Per-Game pace in his first pro season, and has not hit anything resembling a rookie wall. Griffith is a great playmaker and Khokhlachev has hurt the Pens in postseasons past with his offensive prowess. Czarnik is another speedy rookie who has great hockey sense and instincts, he reminds me a bit of Conor Sheary. Former Penguin Stanley Cup hero Max "chicka chicka yea" Talbot has scored 21 Pts in 26 Games during his first season in the AHL since 06-07. The Penguins have the edge in experience here for sure, Dustin Jeffrey was acquired at the deadline and has led the way for WBS since. He has played in two Calder Cup Finals, winning one. 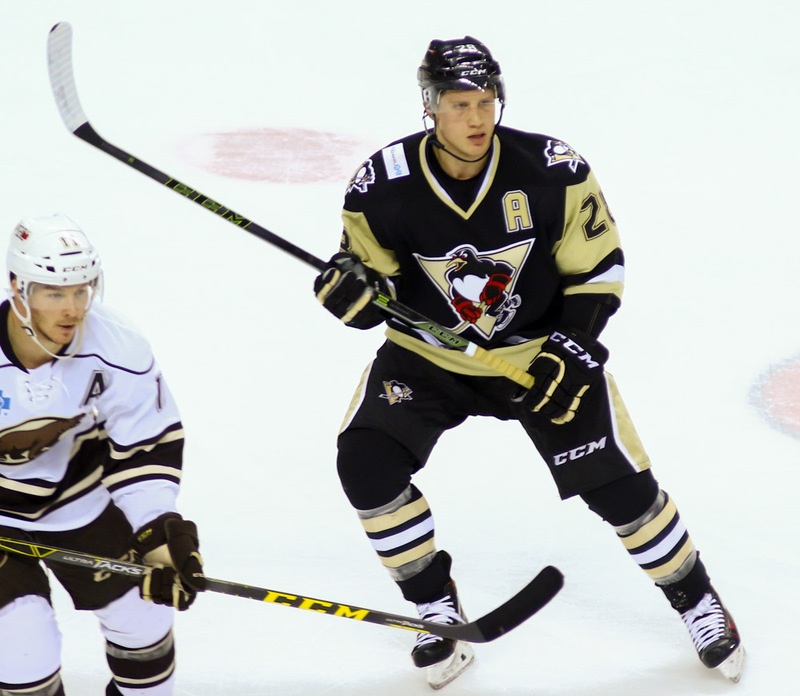 Captain Kostopoulos has also played in two, both losses with WBS. He has been fantastic providing leadership, and still being a regular on the score sheet. Czech Rookie Dominik Simon has been great all year and was 3rd in goals scored by rookies in the AHL. Carter Rowney will look to continue his breakout season into the playoffs. Kael Mouillierat has also played in a Cakder Cup final with the St. Johns Ice Caps. The wide open game will favor the Bruins, but this Penguins forward group are all good two way players, and if they find a way to finish, could easily be the better unit. Speaking of finishing, Daniel Sprong will bring his potent shot and natural goal scoring ability to the WBS roster maybe as early as Game 1. Advantage - Penguins - Providence comes into this series with a Big Physical Defense Unit, led by team captain Tommy Cross. He is a player who impacts the game by making smart plays and being responsible. Irwin, and Youds are both good puck movers and play big PP minutes. Colin Miller is due to return from injury in time for Game 1, and he is a big time addition for the Bruins. He is an above average puck mover with a big accurate shot, and can play a strong game in his own zone as well. Oleksy can impact the series by making life tough on Vatrano. I give the Penguins the advantage because of their ability to create offense from the back end. O'Neill broke team records for Points and Assists in a season for a D-Man. Erixon is another offensive minded player, but he has had an underwhelming season all around. Now is his chance to be the player the Penguins have expected him to be. Steve Oleksy and Nic Andersen are rock solid, physical players who are always positioned smartly and never leave their teammates in a bad spot. Barry Goers has been very good since returning from hip surgery, and newly signed Ethan Prow gets better every game. 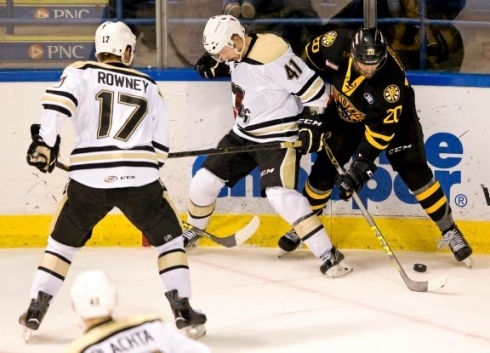 Prow has the ability to be a difference maker for a struggling WBS PP unit. Ryan Parent has played in the Stanley Cup Finals, and if the Penguins need him, the veteran will be ready and will be more than capable of getting the job done. Providence - Obviously Frank Vatrano has been truly special up to this point. If he can sustain his goal scoring pace during his first career playoff series, the Penguins will have a heck of a tough time winning this series. That being said, the playoffs are a different monster, and the Penguins will be making adjustments and matching up with him to try and shut him down. Vatrano can expect to see a steady dose of Steve Oleksy, and if Oleksy has his way, the young sniper won't have a very fun series. 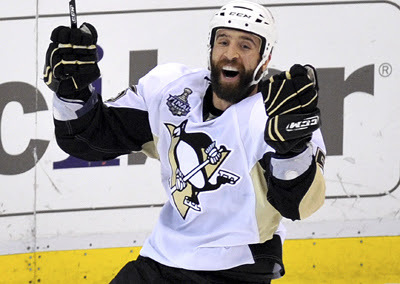 - Max Talbot brings a wealth of Stanley Cup experience to this series. With 2 trips to the Stanley Cup Final, and previous Calder Cup experience with WBS, there is nothing about the playoffs that will surprise Max. His rugged style, and Penalty Killing expertise are perfect for Playoff Hockey. Expect Talbot to play a major role against his former team. WBS - Jake Guentzel has been getting better by the game, and is starting to show glimpses of what made him an NCAA standout. He is gritty and isn't afraid to get physical in the corners and down below the net, yet he has great instincts and is always attacking defenses with his speed. If Guentzel continues to progress, and play well, he could have a huge impact on this series. - Daniel Sprong and the Charlottetown Islanders were eliminated from the QMJHL playoffs on Sunday afternoon. The young Sprong will have to get over it quickly as he will be heading to Wilkes-Barre, possibly in time for game 1. Sprong shocked a lot of people when he made the NHL roster out of camp and certainly did not look out of place. He has the game to be a difference maker in this series. The Pens have been lacking in the finishing department lately and Sprong can fill that gap right away. If he can find some chemistry quickly and bring his instant offense to the team, he may indeed be the ex-factor to tip the scales in the Pens' favor. Penguins in 4. There are quite a few variables yet to be determined. Does WBS get any help from up top? Oskar Sundqvist is a healthy scratch in Pittsburgh right now, and could use the playoff experience in WBS. His excellent penalty killing could be a huge factor considering Providence has the league's top PP. Derrick Pouliot is in a similar situation and he would be a monster addition to the PP. Does Sprong make it to town for Game 1? Is Sahir Gill ready to rejoin the lineup after groin surgery? Despite the question marks, I believe the Penguins Veteran Leaders will use their previous experience to help this young squad put it all together and advance to the Division Final.